How does the Husky Promise work? Your tuition will be covered first by your federal and state grants — like the Pell Grant or State Need Grant. If your eligibility for these programs does not equal the full cost of your tuition, the UW will make up the difference with institutional grants or scholarships. 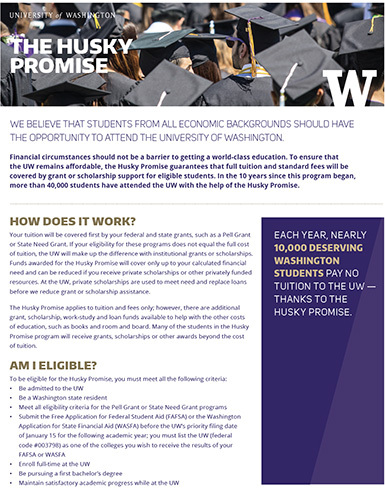 Funds awarded for the Husky Promise will only cover up to your calculated financial need and can be reduced if you receive private scholarships or other privately funded resources. At the UW, private scholarships are used to meet need and replace loans before we reduce grant or scholarship assistance. 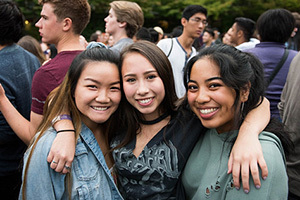 The Husky Promise applies to tuition and standard fees only; however, there are additional grant, scholarship, work-study and loan funds available to help with the other costs of education, like books and room and board. Many of the students in the Husky Promise program will receive grants or scholarships beyond the cost of tuition. Who is eligible and how do I apply for the Husky Promise? 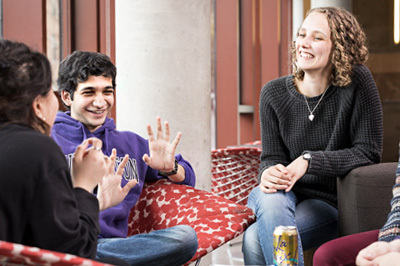 In general, the Husky Promise is available to UW students at all three campuses – Bothell, Seattle and Tacoma – who are Washington state residents and meet the eligibility criteria for the Pell Grant or State Need Grant programs. It is also important to note that the Husky Promise is limited to 12 quarters of eligibility at the UW. Be eligible for the Pell Grant or State Need Grant Program. Submit the Free Application for Federal Student Aid (FAFSA) or the Washington Application for State Financial Aid (WASFA) by the UW’s priority filing date for the following academic year. Review the financial aid application process to find priority filing dates and other application information. Enroll full-time (12 credits or more). Be pursuing a first bachelor’s degree. Maintain satisfactory academic progress while at the UW. To apply, students must submit the Free Application for Federal Student Aid (FAFSA) or the Washington Application for State Financial Aid (WASFA) before the UW’s priority filing date of January 15 for the following academic year. You must list the University of Washington (federal code #003798) as one of the colleges you wish to receive the results of your FAFSA or WASFA. See more information on how to apply to the Husky Promise. Are there other financial aid solutions? If you don’t qualify for the Husky Promise, we still have grant, scholarship, work-study and loan funds that can help pay your educational costs. The Husky Promise is just one way the UW helps students pay for college. In 2017-18, over half of UW’s undergraduates received more than $430 million in financial aid. You must apply for financial aid by filing the FAFSA or WASFA by our priority date of January 15. If you miss the priority date, you may still be considered for financial aid, but for limited types of aid. Visit the Office of Student Financial Aid for more information about our financial aid programs. The Husky Promise is our guarantee to Washington state’s children that if you work hard, there’s a spot for you at the UW.